Computer Music's goal is to help its readers create great music with a PC or Mac. 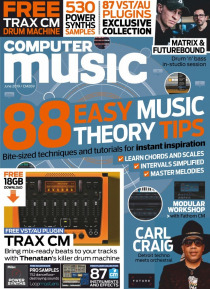 Each month find easy-to-follow tutorials for all sorts of music software, unbiased reviews of the latest products and answers to technical questions. Our Zinio edition does not include the DVD but it DOES INCLUDE the full software, samples and tutorial files to download. Full details inside. Download does not include… Producer Masterclass in-studio video. This digital edition is not printable.